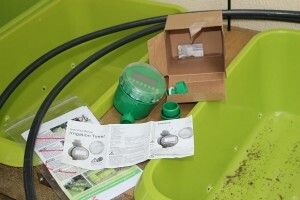 Home > Blog > Christine's garden > What was in the box? 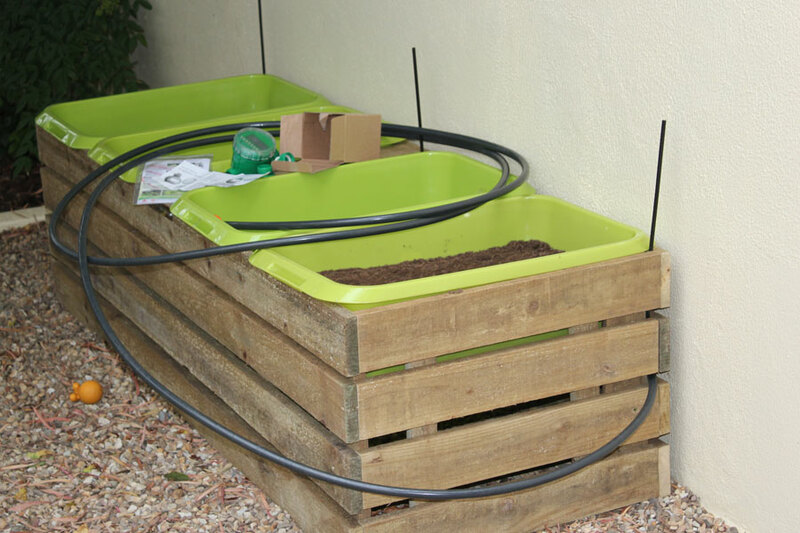 I didn’t make it to the nursery today – too many things going on at work – but we did manage to unpack the box and set up the new veggie planter. So what was in the box? I had someone help me unpack the big parcel, we carried the wooden box to its intended “spot” and then I tried to set up the irrigation pipes and stems. Well, clearly I am way too stupid for this because I had to get my daughter to help me. I felt a bit better when she agreed that the instructions were inadequate and we had it all set up by pushing, pulling and forcing! 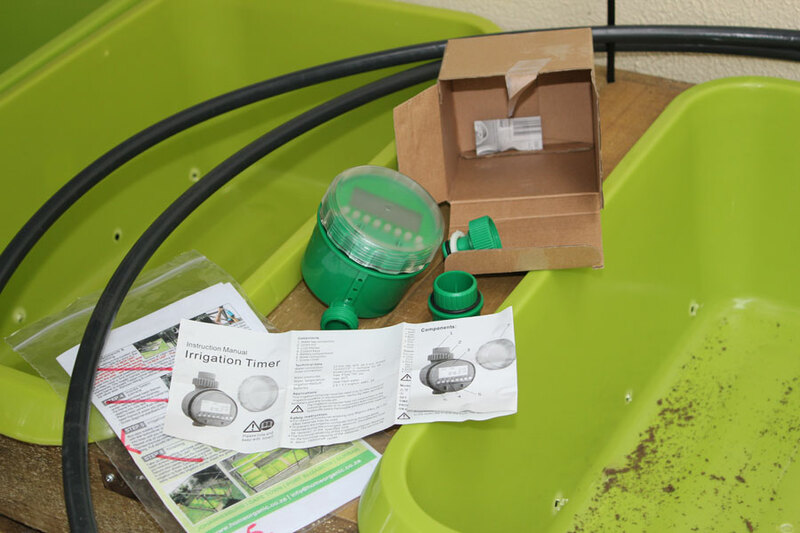 The baskets are in, now all that’s left to do is to connect the irrigation timer and connect it to the water. Then I need to populate it with vegetables and herbs … which I will buy tomorrow and plant over the weekend. PS: In fairness to the “stupid instructions”, I am not the most patient of people and I expect things to slot into place quickly and easily (like Lego!). Truth be told, the whole set up took about 15 minutes, so maybe the instructions are not that bad after all. Hi Chris, You are amazing. When you say you will do someting you really get it done! I might still take time to mull over it first. Well done! You tackled it and it is now all set up and ready! It looks great, but I am a big fan of rustic, so I won’t be the one to ask for colour choice! But I do so love the antique blue idea! That will suit your beautiful garden. If I may suggest you start your planter with herbs. They are hardy and easy to grow and rewarding because you can come outside and pick your fresh parsley and thyme for the supper table and it is always fresh – because you only need a small amount. Let’s go shopping soon! Oh yes, lets go shopping, you know thats my favourite thing . I bought a few basic things today but need help with the rest. Not entirely sure what to get. I bought a Strawberry plant!! I just couldn’t resist it. I thin French blue and lime green would look wonderful together—go for it. I like the planter you’ve just got. I have been dreaming about this. ( I need something to deter the dogs from trampling all over the plants.) I guess you will be growing veggies in them? Read your sad note on the forums, then went to your My Plot, My Blogs – and found a perfect feed direct to This post. It has 17 picks. Maybe Donna’s, wait and it’ll come right has kicked in. Come back? Dear Christine and Barbie, Far be it for me to interfere with your ‘rustic box’ but yes, painted would be much better….only not white. Indeed, any colour other than white since I have always believed that white things in the garden look as if one has thrown Aspirin about!! However, the dilemma is which tint or tone would complement the very vibrant green. Now there, I am stumped!! I am full of admiration that you finally assembled all this highly technological looking stuff…….I should still be trying to work out which way was UP!! I am so pleased that you have made my weblog a Favourite as through this I found you. I look forward to our keeping in touch! Hi Edith, thanks for stopping by and I look forward to staying in touch with you. I’ve enjoyed reading your blog – you write beautifully! Hi Edith, I have to agree – no white! She is amazing to get it all done and set up on her own!